Friends Preschool Childcare has openings for PSNS employees! Getting good daycare is sometimes difficult. Getting great daycare when you have to be at work very early at the Shipyard is now a reality thanks to Friends Preschool Daycare! 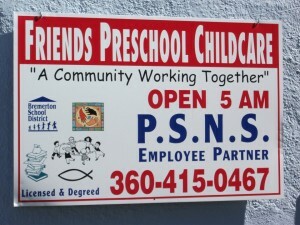 Friends Preschool Daycare is a PSNS employee partner daycare and is offering employees early opening at 4:15 AM . They have great rates, lots of benefits, and are linked with the Bremerton School District Early Childhood Education. They also serve ages 2-6yrs old and they are conveniently located in downtown Bremerton. They enjoy serving PSNS employees exclusively and understand the needs of children and parents with very demanding jobs. They are licensed and hold degrees in Early Childhood Education and have been in business for an amazing 17+ years! Connect with them on facebook and check out all of the excellent reviews from the community and clients. Nothing is better than going to work and knowing that your child is well taken care of. Now if only they would take teenagers!